The AMA Spring Advertising Corporate Tour surpassed my expectations. I was fascinated by the different fields within advertising and being able to have my questions answered by industry professionals. Specifically, Evan Ferrari, the Saatchi & Saatchi advertising strategy director truly taught me about the avenue of strategy behind the advertisements which is now one of my top career choices. I found the Team One environment very rewarding and it helped me realize that virtual and augmented reality are the way to advertise for the future of luxury products. The tour was planned excellently by the AMA board, specifically Brenna Jensen! 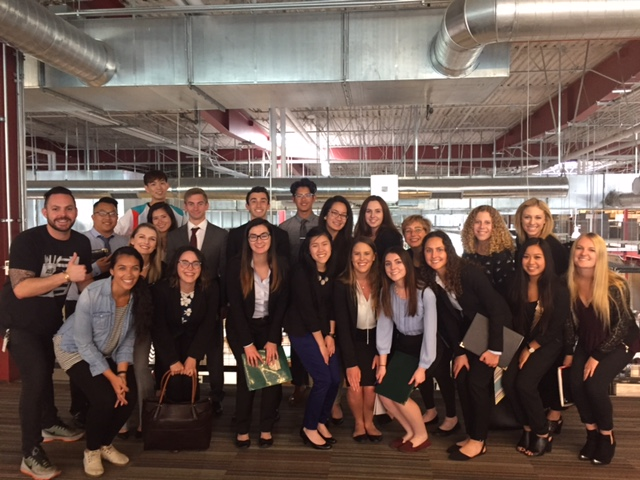 It was truly one of the most rewarding opportunities I have experienced at Cal Poly so far. Touring Saatchi & Saatchi and Team One was truly a one-of-a-kind experience. I thoroughly enjoyed seeing what the creative side of marketing had to offer through engaging with the speakers of various departments. Besides a short presentation by Ogilvy & Mather during an AMA general meeting, I had no real exposure to the advertising industry. In a sense, it opened up a new career pathway in which I really could see myself working in. My favorite part of the tour was viewing all the storyboards of each firm. It really shows how much work goes into an advertisement that is often taken for granted. That being said, I am very thankful for having the privilege to attend this tour and am even more grateful for being a member of Cal Poly AMA. I look forward to future corporate tours and maybe one day working for such amazing companies. On Friday, I traveled to LA with AMA and visited two Advertising Agencies, Saatchi & Saatchi and Team One. I am very interesting in working at an agency after college, so learning about the different positions at the firm was beneficial and gave me an idea of what job I would like in the future. I’m interested in the creative side of marketing, and even more specifically the production side of advertising. I learned that production was a separate part of advertising, giving me more insight about what I should be doing now the will prepare me for an internship later. The best part about the trip was seeing all of the storyboards for commercials and being able to talk to the Creative Director at Saatchi & Saatchi. I would love to be in his position one day, and he gave good advice on how to get to his position.